In this series, meet some of today’s top experts in interior design and décor, and learn how they consider art as part of an overall aesthetic. John Christakos and Maurice Blanks are the co-founders of Blu Dot, an award-winning design studio. As active supporters of the arts, John Christakos serves as the president of the board of trustees at The Walker Art Center in Minneapolis, and Maurice Blanks previously chaired the board of trustees at the Minneapolis Institute of Art. 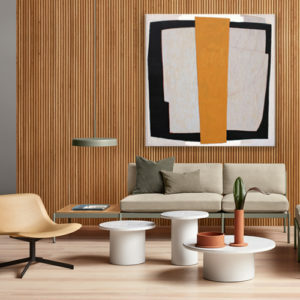 Upgrade your home with a $5000 giveaway from Blu Dot and Saatchi Art. 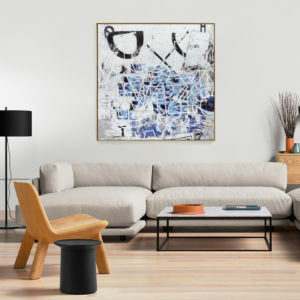 The prize includes $4000 to spend at Blu Dot and $1000 for original art at Saatchi Art, as well as complimentary art advisory services. Enter to win. For John and Maurice, good design means that less is more (difficult). Quoting renowned designer Charles Eames, John has said that good design “[brings] the best to the most for the least.” Echoing the tenets of modernism and modern art movements, Blu Dot’s principles of simplicity, innovation with form, and attention to material and techniques have not gone unnoticed. The design, materials, and fabrication of Blu Dot’s products are comparable to the quality of European designers but at surprisingly affordable prices. Blu Dot is now considered pioneers of democratizing modern design and have become leaders in the field. In 2018, Blu Dot won the National Design Award for Product Design by the Cooper Hewitt, Smithsonian Design Museum—an award that carries the same prestige as the “Oscars” in film or the James Beard Award for the culinary arts.